You're going to want to leave room for dessert. The Vendy awards -- celebrating New York's best street vendors -- announced its 2009 Dessert Finalists Thursday evening via Twitter and the list includes a little hot, a little cold and a little in between. 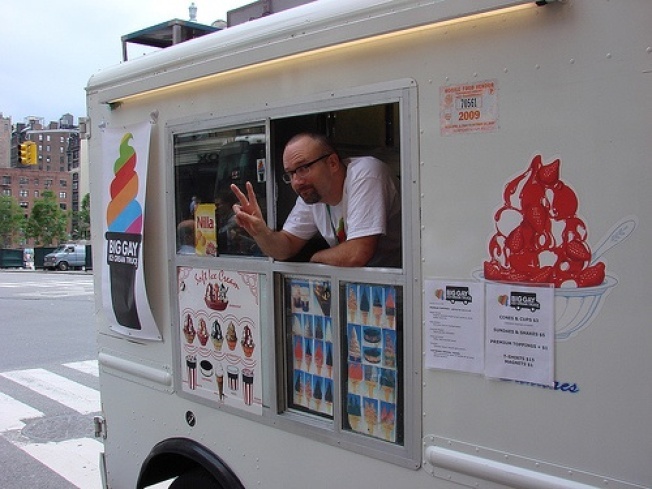 First up is the "Big Gay Ice Cream Truck" ran by Doug Quint with Bryan Petroff. The location varies, but they can always be found on Twitter @biggayicecream. The testimony on their nomination form reads: "Doug's soft serve is anything but vanilla... And really all I can say is Choinkwich: Yummy caramelized bacon, soft serve chocolate ice cream between two cartwheel cookies." Talk about "to die for." Next is "Waffles & Dinges" and chef Thomas DeGeest. Their daily location can also be found on Twitter @waffletruck. "The waffles have an absolutely fantastic flavor, just like the ones in Belgium!" according to the testimonial from their nomination form. Last but not least is Lev Ekster's "Cupcake Stop." The can be found on any given day @cupcakestop on Twitter. The nomination form quote praises Ekster's Red Velvet formula, despite being "a Yankee," and thanks Cupcake Stop for "making my work life bearable." Of course, here at 30 Rock we tend to lean towards Magnolia for all things cupcake. The Vendy Awards get cooking on Saturday, September 26th, from 2pm to 7pm at the Queens Museum of Art, outdoors near the Unisphere in Flushing Meadows Corona Park. Buen Provecho!